German physicist payload specialist astronaut 1978-1998. Status: Inactive; Active 1978-1998. Born: 1941-06-20. Spaceflights: 3 . Total time in space: 49.90 days. Birth Place: Greiz. EDUCATION: Ulf Merbold graduated from Stuttgart University in 1968 with a diploma in Physics. In 1976 he received a doctorate in Sciences (Dr.rer.nat.). RECREATIONAL INTERESTS: Enjoys skiing, glider flying and piano playing. EXPERIENCE: After university, Ulf Merbold joined the Max-Planck-Institute for Metals Research in Stuttgart, first on the basis of a scholarship of the Max Planck Society and later as a staff member, where he studied state and low temperature physics, in particular experimental investigations of lattice defects in body-centred cubic metals. In 1977, Merbold was pre-selected by the European Space Agency (ESA) as a Payload Specialist for the first flight of the European-built Spacelab laboratory on the US Space Shuttle (Spacelab 1). A year later he was nominated as one of the three Payload Specialists for the mission and in 1982 was selected for flight by the ESA Director General, following a recommendation of the Principal Investigators (the scientists involved in the mission). 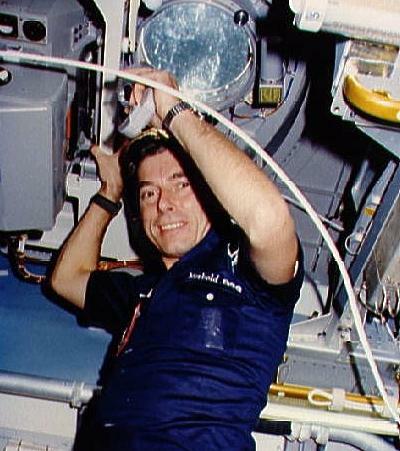 Ulf Merbold became the first non-American to fly on the Space Shuttle during the STS-9 mission (28 November to 8 December 1983), the primary objective of which was the verification of Spacelab in orbit and the execution of 72 highly sophisticated scientific experiments. In 1984 he was involved in the Space Shuttle Spacelab German D-1 mission, as both back-up Payload Specialist and Crew Interface Coordinator (CIC). Merbold transferred to the European Space Research and Technology Centre (ESTEC) in Noordwijk, The Netherlands, in 1986 to support ESA in the planning of Columbus, the European laboratory for the International Space Station. He was appointed Head of the DLR (German Aerospace Research Establishment) Astronaut Office in 1987 and, on the basis of a secondment to DLR, lead the German astronauts and supported the preparation of the D2 mission. In December 1988 he was nominated as ESA Payload Specialist candidate for the International Microgravity Laboratory mission (IML-1) on the Space Shuttle. The IML-1 (STS-42) training programme started in April 1989 and the following January he was selected to fly on the mission which took place between 22 and 31 January 1992. As a member of the payload crew he was primarily responsible for the 55 scientific experiments on the flight. 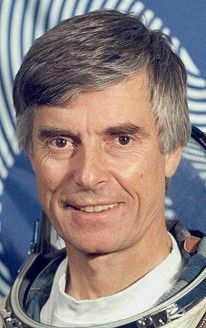 During the second German D2 mission from April 26 to May 6, 1993, Ulf Merbold was Science Coordinator at the Mission Control Centre in Germany. In August 1993, after preparatory courses at the European Astronaut Centre (EAC), he started training at TsPK (Cosmonauts Training Centre) in Star City near Moscow. 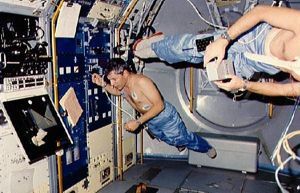 He was selected for flight (Crew 1) for ESA's Euromir 94 mission and became the first ESA astronaut to fly on the Russian space station Mir, performing a 32-day mission between 3 October and 4 November, 1994. As Research Cosmonaut, he was responsible for the execution of 28 European experiments. Merbold holds a commercial pilots licence (CPL2) with Instrument Rating, as well as an Acrobatic licence, and has logged more than 3000 hours as Pilot in Command. SPECIAL HONOURS: Ulf Merbold has received numerous awards, including the First Class Order of the Federal Republic of Germany, the Order of Merit of the States of Baden-W�rttemberg and Nordrhein-Westfalen, the Haley Space Flight Award of the American Institute of Aeronautics and Astronautics, the USSR Pilot-Cosmonaut V.M. Komarov diploma of the International Aeronautical Federation, and the distinction for scientific achievement in Air and Space Medicine from the Deutsche Gesellschaft f�r Luft- und Raumfahrtmedizin. He received the Flight Achievement Award of the American Astronautical Society in 1983 and the "Order of Friendship" from President Yeltsin of the Russian Federation in 1995. The following year Ulf Merbold was awarded an honorary doctorate in engineering (Dr.-Ing. h.c.) by the Rheinisch-Westfalische Technische Hochschule. CURRENT ASSIGNMENT: Ulf Merbold works on development programmes for ESA's contribution to the International Space Station. Family: Astronaut. Country: Germany. Spacecraft: Mir. Flights: STS-9, STS-42, Soyuz TM-19, Soyuz TM-20 Euromir 94. Projects: STS. Agency: ESA. Bibliography: 5781. 1941 June 20 - . Birth of Dr Ulf Dietrich Merbold - . Nation: Germany. Related Persons: Merbold. German physicist payload specialist astronaut 1978-1998. 3 spaceflights, 49.9 days in space. 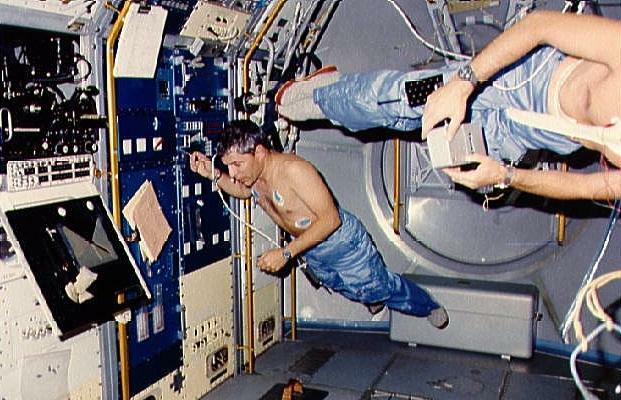 Flew to orbit on STS-9 (1983), STS-42, Soyuz TM-20..
1994 November 4 - . Landing of Soyuz TM-19 - . Return Crew: Malenchenko, Merbold, Musabayev. Nation: Russia. Related Persons: Malenchenko, Merbold, Musabayev. Program: Mir. Flight: Soyuz TM-18 Mir LD-4, Soyuz TM-19, Soyuz TM-20, Soyuz TM-20 Euromir 94. Soyuz TM-19 undocked from Mir with the crew of Malenchenko, Merbold and Musabayev aboard at 07:29 GMT on November 4. The Soyuz instrument module (PAO, priborno-agregatniy otsek) fired its deorbit engine, and was jettisoned together with the orbital module (BO, bitovoy otsek) at 10:51 GMT, with entry interface for the descent module (SA, spuskaemiy apparat) at 10:54. It landed 170 km north-east of Arkalyk in Kazakhstan on 1994 November 4 at 11:18 GMT.